There will be no classes on Friday, April 19 due to Easter Vacation. The final Step-Up class will be on April 26. A free one hour session will be presented by our Science Majors to encourage an interest in Science for K - 12 students. Each session is limited to 10 students. Click the button below to review the list of sessions and to sign up for a session. Click here for the "Magic of Science"! Click on the MORE tab at the top of this page and check out the EVENTS AND OPPORTUNITIES FOR FAMILIES link to see local opportunities for Homeschool Families! We update regularly! The Step-Up Enrichment Program at Saint Vincent College is a program open to all families who are actively home schooling or cyber schooling children in grades PreK - grade 12. Home study students from the surrounding area may choose to participate in as many as three enrichment courses designed and taught by college students who are enrolled in the teacher certification program and supervised by faculty. The courses are held on the campus of Saint Vincent College every Friday afternoon. Each course consists of ten one-hour classes each semester. Each semester brings a new list of course choices in each grade span. Even though each class has a target grade range, these are only guidelines. 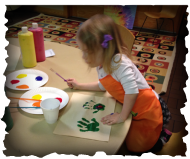 Each child is unique and the program offers flexibility to meet the needs of the child. Our visit to a real theater on campus - The Performing Arts Center! We learned about what goes on backstage and all the elements of a performance. We even got to be on stage! Dissecting in a college biology lab! Learning about computers by building one! 1) Offer assistance and support to home-school families in meeting instructional needs to meet requirements for their specific curricular goals. 2) Encourage a collaborative learning experience through group projects with other home-schooled and cyber schooled students in the area. 3) Enrich the learning experience of nontraditional students through a variety of interesting enrichment units taught by college students in the field of education who aspire to be teachers. Click on the button above to access the Fall 2018 Step-Up dates. a unique and exciting opportunity for home schooled and cyber schooled students to interact with other students who share common interests. an opportunity for home schooled and cyber schooled students to transition into college classroom settings and reduce anxiety when planning for college. pre-service instructors the chance to teach the courses in a required field experience. These college students hold a 3.0 GPA or higher, and must have criminal and child abuse clearances before entering into a classroom. home schooled and cyber schooled students the opportunity to choose courses specifically designed to meet their interests while meeting curriculum requirements. Online registration on the STEP-UP website is available for parents to register their children for up to three classes each semester. There is a $30 family registration fee plus each course is $20. Just follow the registration link at the top of the grade level page. Class sizes are limited, so home schooled and cyber schooled students are accepted on a first-come, first-served basis.